earMUSIC has announced the signing of KMFDM, the renowned industrial rock pioneers from Germany, for the release of "Rocks - Milestones Reloaded" on September 9. The album, a personal "best-of" compilation by KMFDM protagonists and masterminds Sascha Konietzko and Lucia Cifarelli, who claim the re-imagined, re-mixed pieces would be an "ideal playlist for a live set," commemorates the band's 32nd anniversary. Ranging from remixes by Bradley Bills of CHANT to producer/musician extraordinary Marco Trentacoste and Sascha Konietzko himself, the re-worked versions extract the essence of KMFDM's music and, at the same time, place new emphases. In true KMFDM tradition, "Rocks" bears all the band's trademarks: the (mostly) five letters commonly used in the title, as well as the iconic graphics of Aidan Hughes a.k.a. BRUTE!, which are reminiscent in the style of early Soviet Constructivism propaganda. Add to this KMFDM's signature industrial sound, a crossover between techno/dance and heavy metal, and densely distilled political lyrics, which never fail to challenge ignoramuses of every breed, and it is clear why KMFDM is regarded as the epitome and synonym for the musical style of the harder variety. 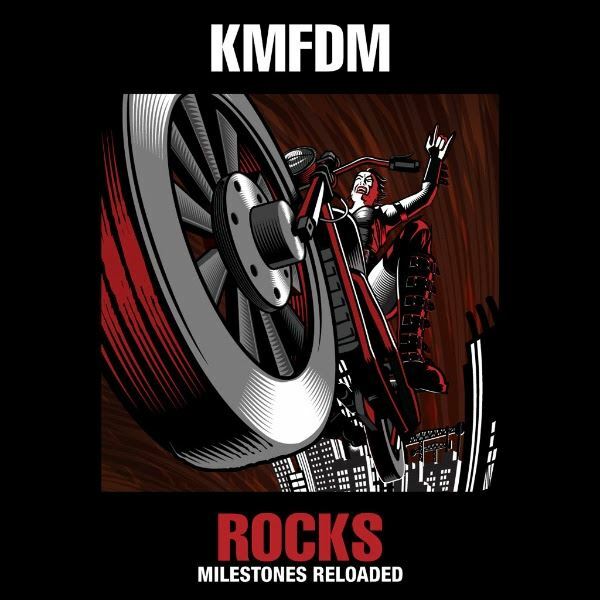 "Rocks - Milestones Reloaded" will be released as CD+DVD media book, including the DVD "We Are KMFDM", CD Standard, 2LP and Digital on September 9 on earMUSIC and is to be followed by a new studio album and an extensive tour in 2017.